Statistics current as of 28 June 2016. Sébastien Olivier Bourdais  (born 28 February 1979) is a French professional racing driver, who resides in St. Petersburg, Florida. He is one of the most successful drivers in the history of American Championship car racing, having won 37 races. He won four successive championships under Champ Car World Series sanction from 2004 to 2007. As of March 2017 [update] he had won 75 races. Champ Car was the trade name for Open Wheel Racing Series Inc., a sanctioning body for American open-wheel car racing that operated from 2003 to 2008. The 2004 Champ Car World Series season was the 25th overall season in the CART/Champ Car genealogy, and the first under the ownership of Open Wheel Racing Series (OWRS). It began on April 18, 2004 and ended on November 7 after 14 races. For sponsorship purposes, it was branded as Bridgestone Presents the Champ Car World Series Powered by Ford. The Drivers' Champion was Sébastien Bourdais. The Rookie of the Year was A. J. Allmendinger. The 2007 Champ Car World Series season was the 29th and final overall season of the Champ Car World Series and the fourth and final season under the Champ Car title. It began on April 8, 2007 and ended on November 11 after 14 races. Unbeknownst at the time, this would end up being the final contested season of Champ Car, as the following February, the series unified with the Indy Racing League (IRL), marking the end of the Champ Car World Series for good. He drove in Formula One for the Toro Rosso team during 2008, and the start of the 2009 season, but was unable to translate his past successes to that competition. As of January 2018 [update] , Bourdais drives for Dale Coyne Racing with Vasser Sullivan in the Verizon IndyCar Series, and for Ford Chip Ganassi Racing as a third driver in the WeatherTech SportsCar Championship and 24 Hours of Le Mans. Scuderia Toro Rosso, commonly known as Toro Rosso or by its abbreviation STR and currently competing as Red Bull Toro Rosso Honda, is an Italian Formula One racing team. When the name "Toro Rosso" is translated to English, it is the exact same word as its sister team - Red Bull. It is one of two Formula One teams owned by Austrian beverage company Red Bull, the other being Red Bull Racing. Toro Rosso functions as a junior team to Red Bull Racing, with the aim of developing the skills of promising drivers for the senior team. The team made its racing debut in the 2006 season, moving to complete independence from its sister team in 2010. Born into a racing family in Le Mans (his father Patrick races in touring cars, hill climbs, and sports cars), Bourdais began his racing career at age 10 in karts. During the early 1990s, he competed in a variety of karting championships, winning the Maine Bretagne League in 1991 and the Cadet France championship in 1993. Bourdais was part of the winning Sologne Karting team which won the 1996 24-hour Le Mans kart race at the Circuit Alain Prost on a Merlin chassis with Atomic motors. 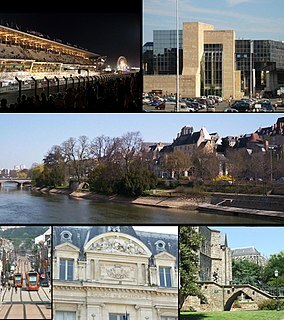 Le Mans is a city in France, on the Sarthe River. Traditionally the capital of the province of Maine, it is now the capital of the Sarthe department and the seat of the Roman Catholic diocese of Le Mans. Le Mans is a part of the Pays de la Loire region. Patrick Bourdais is a retired French racing driver. He is the father of Sébastien Bourdais, who competed in many categories, including Formula One. Bourdais progressed to single-seater racing in 1995, finishing 9th in the Formula Campus by Renault and Elf Championship. He then spent two years in the French Formula Renault Championship, ultimately finishing second in points in 1997 after winning four races and five pole positions. In 1998, he won five races to become Rookie of the Year (6th overall) in French F3. He won the series outright in 1999, with eight wins and three poles. An open-wheel car is a car with the wheels outside the car's main body, and usually having only one seat. Open-wheel cars contrast with street cars, sports cars, stock cars, and touring cars, which have their wheels below the body or inside fenders. Open-wheel cars are usually built specifically for road racing, frequently with a higher degree of technological sophistication than in other forms of motor sport. Open-wheel street cars, such as the Ariel Atom, are very scarce as they are often impractical for everyday use. French F4 Championship, formerly known as Formula Renault Campus France, Formula Campus, Formul'Academy Euro Series, F4 Eurocup 1.6 is a form of open wheel racing founded in 1993 by Louis Drouet. It is based in France and aims at karting graduates, like Formula Ford, ADAC Formel Masters and Formula Abarth. The series currently organized in collaboration with the Fédération Française du Sport Automobile (FFSA), Auto Sport Academy and Total S.A.. The champion receives support to continue in one of the Formula Renault 2.0 championships. The French Formula Three Championship was a motor racing series for Formula Three cars held in France between 1964 and 2002. The series merged with the German Formula Three Championship in 2003 to form the Formula 3 Euro Series. The Formula 3000 International Championship was a motor racing series created by the Fédération Internationale de l'Automobile (FIA) in 1985 to become the final preparatory step for drivers hoping to enter Formula One. Formula Two had become too expensive, and was dominated by works-run cars with factory engines; the hope was that Formula 3000 would offer quicker, cheaper, more open racing. The series began as an open specification, then tyres were standardized from 1986 onwards, followed by engines and chassis in 1996. The series ran annually until 2004, and was replaced in 2005 by the GP2 Series. DAMS is an auto racing team from France, involved in many areas of motorsport. DAMS was founded in 1988 by Jean-Paul Driot and former Formula One driver René Arnoux. It is headquartered near Le Mans, only 2 km from the Bugatti Circuit. Bourdais won his second Champ Car title in 2005. Following in the footsteps of recent F3000 graduates such as Juan Pablo Montoya and Bruno Junqueira, Bourdais moved to Champ Car racing in the United States and joined Newman/Haas Racing for the 2003 CART season. At St. Petersburg, Florida, Bourdais became the first rookie since Nigel Mansell to claim pole position for his very first race. However, he did not finish higher than 11th until his fourth race, when he led 95 laps en route to his first Champ Car victory at Brands Hatch. Juan Pablo Montoya Roldán is a Colombian racing driver. He currently competes in the WeatherTech SportsCar Championship driving for Acura Team Penske. Bruno Junqueira is a Brazilian race car driver who most recently competed in the IRL IndyCar Series. He is a former Formula 3000 champion and three-time runner-up in the Champ Car World Series. Newman/Haas Racing was an auto racing team that competed in the CART series and the IndyCar Series from 1983 to 2011. The team operations were based in Lincolnshire, Illinois. Newman/Haas Racing was formed as a partnership between actor, automotive enthusiast, and semi-professional racer Paul Newman and long-time auto racing impresario Carl Haas. The duo were competitors in sports car racing during the 1970s and early 1980s. In 1983, joined forces to enter the ranks of Indy car racing. 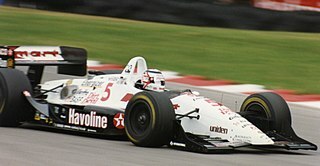 Newman/Haas was one of the most-successful teams in Indy car racing during the 1980s, 1990s, and 2000s. The team won 105 CART/Champ Car races and eight season championships. He followed this up with another victory at the Lausitzring. By the end of the season, he had earned five more podium finishes, including a win from pole at Cleveland. With a runner-up finish in Mexico City, he clinched the Rookie of the Year title and finished 4th in the overall standings. Staying with Newman-Haas for 2004, Bourdais dominated the Champ Car series with seven wins and eight poles in his McDonald's-sponsored Lola, beating his team mate Junqueira by 28 points. His record also included podium finishes in 10 out of 14 events and qualifying results no lower than third all season. Bourdais winning the 2007 Grand Prix of Houston. Bourdais successfully defended his Champ Car title in 2005 with five wins in six races towards the end of the season, again with the Newman-Haas/Lanigan team. That May, he also finished 12th in his first Indianapolis 500. Bourdais won a third consecutive Champ Car title in 2006. His season began with four consecutive victories at Long Beach, Houston, Monterrey, and Milwaukee, although his winning streak was ended by the emergence of A. J. Allmendinger, who won three races in a row through the middle of the season. Bourdais responded with a commanding victory from pole at San Jose, leaving him leading the Champ Car points standings. 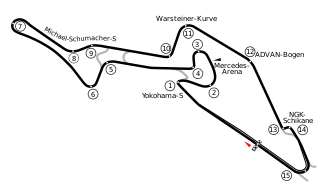 However, an incident with his arch-rival Paul Tracy that knocked him out on the final lap of the following race in Denver, and a subsequent win by Allmendinger narrowed the gap between the two. Bourdais's win in Montreal and Allmendinger's DNF had widened his points lead to 62 points with three races left, and Bourdais clinched the championship at the next race in Surfers Paradise despite a weak performance in that race. Bourdais became the first Champ Car driver to win three consecutive titles since Ted Horn achieved the hat trick in 1948. Bourdais won a fourth consecutive Champ Car title in 2007 with victory at Lexmark Indy 300 on 21 October. Bourdais driving for Toro Rosso at the 2008 Japanese Grand Prix. Bourdais driving for Toro Rosso at the 2009 Malaysian Grand Prix. Bourdais returned to F1 in 2007 after being given several tests with Scuderia Toro Rosso. On 10 August 2007 it was announced Bourdais would replace Vitantonio Liuzzi  at Red Bull's b-team, Toro Rosso, as team-mate to Sebastian Vettel. On 16 March 2008 Bourdais competed in his first Formula One Championship race, the 2008 Australian Grand Prix in Melbourne. After qualifying in 17th position he took advantage of mistakes made by other drivers, in the first Formula One race since the 2001 San Marino Grand Prix without traction control, and worked his way up to fourth. However, with three laps remaining an engine problem forced Bourdais to retire, but he was still classified 8th having completed more than 90% of the race distance. He later inherited seventh place (and two Championship points) after the disqualification of Rubens Barrichello. Bourdais qualified ninth for the Belgian Grand Prix. During the race he quickly gained places and held on to fifth place for much of the distance, and was on course for a podium position. As the rain fell harder on the last lap he was overtaken by several cars on wet tyres and finished 7th. After the race an emotional Bourdais was in tears following the result. This marked his best weekend of the season and his first World Championship points since Melbourne. Bourdais tested significantly for the Toro Rosso team during the winter, though he was uncertain of a drive heading into the new year. 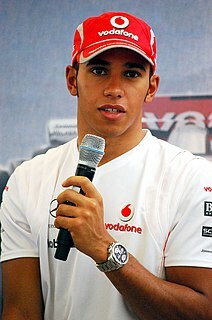 On 6 February 2009 however he was confirmed as a Toro Rosso driver for a second year, partnering Swiss rookie Sébastien Buemi. Despite two points finishes in the year at the Australian Grand Prix and in Monaco, Bourdais struggled to match his less experienced team-mate. In Spain Bourdais struck Buemi's car as the field attempted to avoid a spun Jarno Trulli on the first lap, ending the race for both drivers. At the British Grand Prix Bourdais collided with McLaren driver Heikki Kovalainen, again ending the race for both. At the German Grand Prix he suffered a mechanical failure after qualifying last by over a second. The Dome S102.5 that Bourdais drove at the 2012 24 Hours of Le Mans. Bourdais has frequently contested the famous 24-hour race of his home town, entering for the first time in 1999 (aged only 20) in a Porsche 911 GT2 run by Larbre Compétition. The car, which he shared with Pierre de Thoisy and Jean-Pierre Jarier, retired after 134 laps with engine failure. While racing in the junior formulae and Champ Cars, Bourdais made several appearances in other championships. He won the Spa 24 Hours in 2002 with Christophe Bouchut, David Terrien and Vincent Vosse in a Larbre Compétition Chrysler Viper GTS-R. He also won his class at the 2006 12 Hours of Sebring in a Panoz Esperante. In 2005 he also competed in the International Race of Champions, winning his first stock car race at Texas Motor Speedway. In 2009, he set the official lap record at Sebring International Raceway, during the 12 Hours of Sebring. In 2010, Bourdais raced with Scott Tucker, Christophe Bouchut, Emmanuel Collard and Sascha Maassen for Crown Royal in a Level 5 Motorsports prepared Daytona Prototype in the prestigious Rolex 24 at Daytona, held at Daytona International Speedway in Florida. Bourdais recorded incredibly fast laps before the car retired due to an engine failure with Collard at the wheel. In October 2010, Bourdais drove with Jonathon Webb in the Mother Racing Ford Falcon V8 Supercar in the Gold Coast 600. In October 2011, Bourdais drove with Jamie Whincup in the Team Vodafone Holden Commodore V8 Supercar in the Gold Coast 600, winning Saturday's opening race and finishing second in the second race landed Bourdais the inaugural Dan Wheldon Memorial Trophy, awarded to the international driver who scored the most points over the Gold Coast weekend. Wheldon had been set to contest the event but lost his life in the 2011 IndyCar season finale just a week earlier. Winning the V8 Supercar race meant that he is the only driver to have won a race at the Surfers Paradise Street Circuit in both Champcar/Indycar, as well as V8 Supercar. He has also participated in the Bathurst 1000 once, finishing ninth with Lee Holdsworth in 2015. In July 2012, Bourdais won the inaugural Brickyard Grand Prix Rolex Sports Car Series race at Indianapolis Motor Speedway, teaming with Alex Popow in the No. 2 Starworks Motorsport Riley-Ford Daytona Prototype. In October, Bourdais teamed up again with Jamie Whincup in the Team Vodafone Holden Commodore V8 Supercar for the Gold Coast 600, again taking the victory on Saturday and scoring enough points on Sunday to win the event. This also awarded him the Dan Wheldon Memorial Trophy for the second time. He won the Rolex 24 at Daytona in 2014 in the Action Express Corvette DP with João Barbosa and Christian Fittipaldi. In 2015 he finished second at the 24 Hours of Daytona and claimed the win at the 12 Hours of Sebring, both with an Action Express Corvette DP. Bourdais made his IRL debut at the 2005 Indianapolis 500. In his first full-time season in the IRL (2011) with Dale Coyne, Bourdais wound up 23rd in the championship, scoring fastest race lap at Edmonton. A switch to Dragon Racing Team for 2012–13, first with the ill-fated Lotus, then with improved Chevrolet power, he finish 25th and 12th, respectively, in the IndyCar championship. By 2014, Bourdais broke through for two pole positions, and one victory. By midpoint in the 2015 season, his second year driving for Jimmy Vasser's KV Racing team alongside teammate Stefano Coletti, Bourdais's stock steadily rose, to top 20 status in the world drivers' ranking. On 20 July 2014, having won the 1st heat race in Toronto, Sébastien Bourdais joined Al Unser, Jr. and Ryan Hunter-Reay as the third driver in the history of organised motor sport to score open-wheel Championship Racing victories, under three sanctioning bodies (e.g., CART, and CCWS, and IRL sanction), in North America. Against stiff opposition, Bourdais finished 2014 scoring 5 top-5s, and 10th overall in the 2014 IRL championship. On 31 May 2015, in the second heat race at Belle Isle, Detroit, in a drive from far back on the grid harkening back to Stefan Bellof at Monaco in 1984, effortlessly carving his way by lesser drivers on a tight, composite street circuit, in heavy rain, breaking through with an impressive, high-profile victory and fastest race lap, Bourdais recorded his 33rd victory in American Championship car racing, just behind Al Unser, Jr. with 34. On 12 July 2015, at the Milwaukee Mile, Bourdais dominated the field and had the entire field a lap down at one point and won, his second of the 2015 season. He finished 10th in points. After KV Racing went down to one team for 2016, Bourdais struggled with a lone win again at Detroit. He finished in 14th in points for 2016. In October 2016, it was announced that Bourdais would make the change to Dale Coyne racing to drive the number 18 for the 2017 season. His KVSH race engineer Olivier Boisson would also follow him to DCR. In his first race back to DCR, Bourdais won the Firestone Grand Prix of St. Petersburg to start the 2017 season coming from last after a qualifying crash, on 12 March 2017. He backed this up with another recovery drive at the Long Beach race, starting from ninth and making an early rear wing change, to finish second, extending his lead in the series standings. On 20 May 2017, Bourdais was involved in a single-car accident while qualifying for the Indianapolis 500. He suffered multiple fractures to his pelvis and a fracture to his right hip. The surgery was successful but Bourdais was forced to sit out for most of the season to recover. Bourdais would return at Gateway and run the final three races of the season. In 2018, Bourdais returned to the Dale Coyne Racing Team now partnered with investors James "Sulli" Sullivan and former driver Jimmy Vasser as Dale Coyne Racing with Vasser Sullivan. The team also found steady sponsorship in the form of SealMaster, and SportClips Haircuts. Bourdais started The Firestone St. Petersburg Grand Prix in 14th place. He ended up losing a tire on the opening lap but the misfortunes of Will Power and Tony Kanaan saved him from going a lap down. He went on a off sequence pit strategy and found himself 3rd with a handful of laps to go. On the final restart, Alexander Rossi divebombed the first corner and got his tires locked up on the slick airport runway paint and got into race leader Robert Wickens who had led 67 laps that day and Bourdais snuck by to win. It was his first win since last year at St. Petersburg and his first since the injury. Bourdais was emotional in victory lane and said "he never doubted that he would run in IndyCar again". Bourdais went on to win pole at the very next race in Phoenix, his first on an oval since 2006. Bourdais was also the only driver to lead laps at each of the first four races of the 2018 Verizon IndyCar Series season. 1 Includes points scored by other Sevilla FC drivers. 2 Includes points scored by other Olympique Lyonnais drivers. † Did not finish the race, but was classified as he completed more than 90% of the race distance. 1 Driver competed for the Intercontinental Le Mans Cup, no points awarded for the American Le Mans Series. 1 Driver competed for the Intercontinental Le Mans Cup, no points awarded for the Le Mans Series. 1 Driver did not run for the Intercontinental Le Mans Cup. ↑ "Sebastien Bourdais". news.bbc.co.uk. 2 March 2009. Retrieved 5 March 2009. 1 2 3 4 5 6 "Who's Who: Sebastien Bourdais". F1Fanatic.co.uk. 2007. Retrieved 11 August 2007. ↑ "Bourdais replaces Liuzzi for 2008". F1Fanatic.co.uk. 10 August 2007. Retrieved 10 August 2007. ↑ Beer, Matt (6 February 2009). "Bourdais confirmed at Toro Rosso". autosport.com. Haymarket Publications . Retrieved 6 February 2009. ↑ Elizalde, Pablo (16 July 2009). "Toro Rosso confirms Bourdais' exit". autosport.com. Haymarket Publications . Retrieved 16 July 2009. ↑ "Toro Rosso confirms Bourdais' exit". itv-f1.com. ITV. 17 July 2009. Archived from the original on 19 July 2009. Retrieved 17 July 2009. ↑ "Toro Rosso settles with Bourdais". gp.com. 7 August 2009. Retrieved 7 August 2009. ↑ "Audi claim victory as Peugeot crumble". Autosport.com. 13 June 2010. Retrieved 13 June 2010. ↑ "Bourdais joins Superleague Formula". AOL. 2009. Archived from the original on 22 August 2011. Retrieved 26 November 2009. ↑ "Bourdais wins on Superleague debut". ITV-F1. 2009. Archived from the original on 10 September 2009. Retrieved 26 November 2009. ↑ "Superleague: Bourdais wins Estoril super final". Racer. 2009. Archived from the original on 26 July 2011. Retrieved 26 November 2009. ↑ "Bourdais making his mark in Superleague, wins race one at Monza". AutoWeek. 2009. Archived from the original on 9 October 2009. Retrieved 26 November 2009. ↑ Weeks, James (24 October 2011). "Whincup and Bourdais star in Gold Coast 600". motorstv.com. Motors TV. Archived from the original on 26 October 2011. Retrieved 15 November 2011. ↑ Malsher, David (20 May 2017). "Indy 500: Bourdais suffers huge shunt in qualifying". Motorsport.com. Motorsport Network. Retrieved 21 May 2017. ↑ Straw, Edd (20 May 2017). "Bourdais to undergo surgery on multiple fractures". Motorsport.com. Motorsport Network. Retrieved 21 May 2017. ↑ "Sebastien Bourdais' Indycar season is over". f1i.com. Retrieved 21 May 2017. Wikimedia Commons has media related to Sébastien Bourdais . Takuma Sato is a Japanese professional racing driver. Sato has raced full-time in the IndyCar Series since 2010 for the KV, Rahal, Foyt, Andretti, and starting in 2018, once again, the Rahal teams. Sato won the 2013 Toyota Grand Prix of Long Beach, becoming the first Japanese driver to win an IndyCar race. He is also the first Asian driver to win the Indianapolis 500, having won the 2017 event. He competed in Formula One from 2002 to 2008 for the Jordan, BAR and Super Aguri teams, scoring a single podium at the 2004 United States Grand Prix. Red Bull Racing is a Formula One racing team, racing under an Austrian licence and based in the United Kingdom. The team raced under a British licence from 2005 to 2006 and has raced under an Austrian licence since 2007. It is one of two Formula One teams owned by beverage company Red Bull GmbH, the other being Scuderia Toro Rosso. The team has been managed by Christian Horner since its formation in 2005. Vitantonio "Tonio" Liuzzi is an Italian professional racing driver who formerly raced in Formula One for the Red Bull, Toro Rosso, Force India and HRT teams. He has homes in Lugano, Switzerland and Pescara, Italy. Scott Andrew Speed is an American race car driver, who currently races in Global Rallycross for the Subaru Rally Team USA team. Neel Jani is a Swiss professional racing driver. His father is from India and his mother is German-speaking Swiss. Robert Michael Doornbos is a Dutch racing driver. He has been test and third driver for the Jordan and Red Bull Racing Formula One teams, as well as driving for Minardi and Red Bull Racing in 2005 and 2006. Doornbos then drove for Minardi Team USA in the 2007 and final season of the Champ Car World Series. He competed in the Superleague Formula racing series in 2008, and drove for the Netherlands team in A1 Grand Prix's 2008–2009 season. In 2009, Doornbos competed in the IndyCar Series. He began the season with Newman/Haas/Lanigan Racing, but switched to HVM Racing after the race in Kentucky Speedway. The Red Bull Junior Team is a driver development program run by the energy drink company Red Bull GmbH in an attempt to identify potential future racing stars in open wheel racing. The similar Red Bull Driver Search, now ended, was an American spinoff of the same idea. Members of the Junior Team are financed and sponsored by Red Bull in lower racing formulae. Simon Pagenaud is a French professional racing driver. He currently races in the IndyCar Series with Team Penske. After a successful career in sports car racing that saw him taking the top class championship title in the 2010 American Le Mans Series, he moved to Formula Racing in the Indycar Series where he became the 2016 IndyCar champion. The Toro Rosso STR2 is the car with which the Scuderia Toro Rosso team competed in the 2007 Formula One season. It was unveiled on February 13, 2007 at the Circuit de Catalunya. The car is, controversially, a variant of the Red Bull RB3 chassis. It was initially driven by Vitantonio Liuzzi and Scott Speed, until Speed was replaced by Sebastian Vettel at the Hungaroring for the remainder of the season. 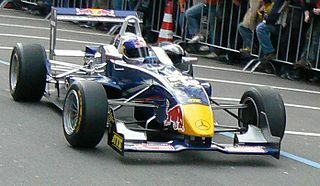 The car in a modified form was also used to compete in the first four races of the 2008 Formula One season. The modified car was driven by Sébastien Bourdais, four-consecutive-time Champ Car winner, and Vettel. The STR2 was the first-ever Toro Rosso F1 car to use the mandatory 90-degree Formula One V8 engine configuration but Toro Rosso opted for the 2006-spec Ferrari 056 instead of the 2007-spec because of 1-year old Toro Rosso engine policy and also cost reasons. Sébastien Olivier Buemi is a Swiss professional racing driver, who formerly competed for Scuderia Toro Rosso in Formula One. In F1, Buemi is currently a reserve driver for Scuderia Toro Rosso's sister team, Red Bull Racing. 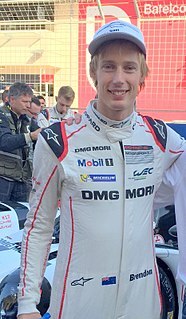 Brendon Hartley is a New Zealand professional racing driver who formerly competed in Formula One for Scuderia Toro Rosso. As of 2019, Hartley is a test and simulator driver for Scuderia Ferrari. The 2007 Belgian Champ Car Grand Prix was the eleventh round of the 2007 Champ Car World Series Season. It was held on August 26 at Circuit Zolder in Heusden-Zolder, Belgium. The race was won by Sébastien Bourdais and was his sixth victory of the season. The 2007 Gran Premio Tecate was the fourteenth and final round of the 2007 Champ Car World Series season. It was held on November 11, 2007 at the Autódromo Hermanos Rodríguez in Mexico City, Mexico. The race was won by Sébastien Bourdais in his last Champ Car race before joining the Scuderia Toro Rosso team in Formula One. With the merger of the Indy Racing League and Champ Car World Series in 2008 it would turn out to be the final event run under the Champ Car banner, and 2nd last under the v8 turbo formula. Daniel Joseph Ricciardo is an Australian racing driver who is currently competing in Formula One for the Renault F1 Team. He entered Formula One as a test driver for Scuderia Toro Rosso and made his debut at the 2011 British Grand Prix with the HRT team as part of a deal with Red Bull. He then raced for Toro Rosso for the 2012 and 2013 seasons. After Mark Webber announced his retirement from Formula One, Ricciardo was confirmed as his replacement at Red Bull Racing for 2014. In his first season with Red Bull, Ricciardo finished third in the championship with his first three Formula One wins, in Canada, Hungary, and Belgium. After two years without victory, Ricciardo won the 2016 Malaysian Grand Prix, eventually sealing third in the championship for the second time in three years at the 2016 Mexican Grand Prix. Ricciardo won the Azerbaijan Grand Prix in 2017 and the Chinese and Monaco Grands Prix in 2018. On 3 August 2018 it was announced that he will be joining Renault on a 2-year contract for the 2019 and 2020 F1 seasons. Jaime Víctor Alguersuari Escudero, also known as Jaume Alguersuari, is a Spanish retired racing driver best known for competing in Formula One between 2009 and 2011, and for being the 2008 British Formula 3 champion. 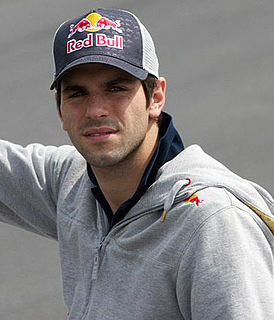 He is the son of Jaime Alguersuari, Sr., a former motorcyclist and racing driver. The Toro Rosso STR4 was a Formula One car which Scuderia Toro Rosso used in the 2009 Formula One season. The car was revealed to be a Red Bull RB5 with a 2008-spec Ferrari 056 engine in Barcelona on March 9, 2009. It was revealed before the testing session. The 2009 German Grand Prix was the ninth race of the 2009 Formula One season. It was held on 12 July 2009 at the Nürburgring in Nürburg, Germany; the earliest German Grand Prix on the calendar, since 1926.